The Gunflint Trail is a 57-mile road that begins in Grand Marais, winds northwest, and is surrounded by Superior National Forest and the Boundary Waters Canoe Area Wilderness. It ends at Saganaga Lake, just short of the Canadian border. The Trail has been designated a National Scenic Byway. It’s home to private residences, several resorts, outfitters and campgrounds, and a few county parks. It has an abundance of wildlife including the biggies: moose, black bear and timber wolves. I was first introduced to the area in my mid-teens, but fell in love with it the summer after I graduated from college in 1987. I was invited to be a camp counselor at a Christian wilderness discipleship camp called Okontoe. That summer would prove life changing for me. Not just because of establishing relationships with the wonderful folks at Okontoe, but because of the beauty of the lakes, forest, rivers and wildlife of the area. Bow Lake—small, but oh so picturesque! 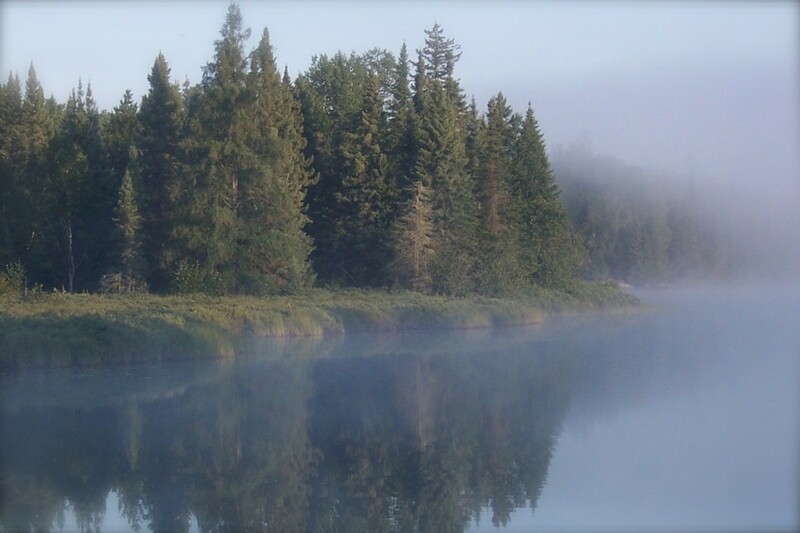 The Gunflint Trail might be best-known as one of the gateways into the Boundary Waters. But it’s also a prime wilderness destination in its own right. It’s got a colorful history with its Native American roots, along with the 20th century pioneers who carved a life out of the bush. Outdoor recreation opportunities abound — camping, fishing, canoeing, kayaking, hiking, nordic skiing, snowshoeing. And of course just sitting and soaking in the beauty. Because of it’s proximity to Lake Superior and it’s 1,200-foot elevation rise from the Lake, the Trail gets heavy snowfall every winter. Some winters (like this past one in 2014/15) it was the only place in the state that had good snow for the skiers and snowmobilers. Those same conditions also make it one of the coldest regions of the state, with temps getting down as low as the -40s and -50s. A 20-below night is commonplace there (I remember during one January I was there, the highs each day that week were -20!). We like to bring our friends there…I think you can see why! Another spot we love to bring people if we have 3/4 of a day and nice weather — STAIRWAY PORTAGE. It’s one of the most beautiful spots in the Boundary Waters and happens to be very accessible off the Gunflint Trail with only an hour’s paddle (if the weather’s nice!). Access is also about half-way up the Trail, off the Hungry Jack Road. This is a very popular day trip, so you’re better off getting to the small parking lot earlier in the day in mid-summer. Or if you’ll be renting canoes, it works great to rent them from either Hungry Jack Lodge or Hungry Jack Outfitters (both also on the Hungry Jack Road), and take off right from the landing with an additional 20 minutes of paddling and one more short portage. That’s Canada on the far shore. Pretty, eh? A nice paddle on scenic lakes, a real BWCA portage or two — a real challenging one if you decide to take your canoes down the 132ish steps on the portage…and back up, of course! Nice hikes with several overlooks, and great swimming at the bottom of the portage in Rose Lake. It’s a winner. Read more here. After your day trip, it’s off to Trail Center Lodge for supper, or at least their famous malts. That’s right across the Gunflint from the Hungry Jack Road. What could be more convenient? And the food is great. 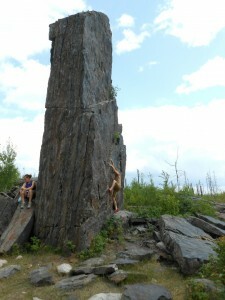 Another hike we like along the Gunflint Trail is the MAGNETIC ROCK TRAIL. It’s not far from the end of the Gunflint. Look for the parking area and trailhead on the right shortly after the Cross River bridge. What’s cool about this trail is it’s been through The Blowdown of ’99 (a straight-line wind storm that leveled millions of trees in the BWCA and Gunflint Trail corridor), a prescribed burn, and then the Ham Lake Fire of 2007. So the landscape is fascinating. And of course there’s Magnetic Rock — a 60-foot slab of “glacial erratic” (it was dropped from glacial ice). It looks like someone just placed it there in the middle of the woods — except that the woods have since blown over and burned, so it’s sitting out in the open, looking impressive. And last but not least — blueberries! They must love the remnants of ashes because the best blueberries we’ve found lately are the ones growing in the areas burned out by the last forest fire. The berries are ripe in mid-summer.